Gerbils are great pets for older children who have mastered proper handling techniques. They are easy to look after, gentle, hearty and seldom bite. And unlike hamsters, Mongolian gerbils — which are most commonly kept as pets — are active during the day, which typically fits in well with a child’s schedule. 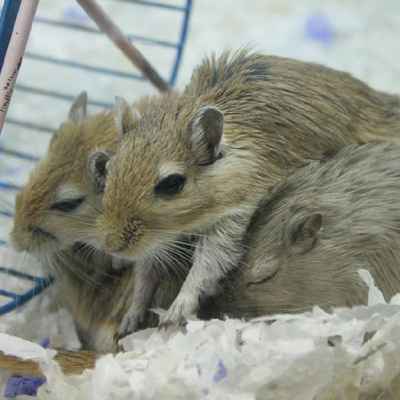 However, all gerbils are very frisky and can easily escape from a cage that isn’t closed securely. And because they have poor eyesight, you’ll need to take extra care when they are outside the cage. Gerbils are very sociable animals and get lonely and unhappy if they are kept on their own, so it’s a good idea to get at least two. However, do not keep males and females together, or they will breed. Also, two males not raised together may be prone to fighting. Gerbils also like lots of room to run around and play, so a large multi-level wire cage or a 10-gallon aquarium with a wire mesh cover will work best. The enclosure should be placed away from direct sunlight and drafts. Because they love exercise, gerbils need a running wheel. Make sure that the wheel has a solid surface without wire rungs so their tails won’t get caught. Gerbils love to climb and run around, another reason a multi-level habitat is optimal. Gerbils also like to hide, crawl and sleep inside enclosed spaces, so put a small box with an entrance hole, a medium-sized never-used flower pot or tubes (cardboard tubes from paper towels and toilet paper will do fine) in the cage. Gerbils love to gnaw, so place hearty toys in the cage that will stand up to constant chewing, such as unpainted, untreated pieces of wood, cardboard tubes or safe chew toys in the cage. This is crucial for keeping their teeth in good condition. The home for your Gerbils should be lined with paper bedding for added absorbency and odor control. Do not use cedar chips, as aromatic oils in cedar bedding have been shown to have adverse health effects on small pets. Gerbils also love to nest! Provide them with natural nesting material. Spread it around the habitat, and they will forage and gather it into a comfy nest. Remove soiled bedding, droppings and stale food from the cage daily. Clean the cage completely once a week by scrubbing the bottom of the cage and soiled accessories with warm water and a gentle soap and replacing dirty litter and bedding. Make sure to rinse and dry everything completely before returning it to the cage. A good diet consists of commercially available pellet-based food specifically formulated for gerbils. Because gerbils are omnivorous, the ideal diet should contain 16-20 percent protein. You can also supplement your gerbil’s diet with carrots, leaf lettuces, turnips, broccoli and small amounts of apples or banana. Gerbils will not drink large quantities. In fact, in the wild, gerbils don’t drink water at all because they get enough of it from plants and roots. However, they do need a constant supply of clean fresh water at all times. Before you handle a gerbil, he may need a little time to get used to you. Start by feeding him small treats. Once you’ve earned his trust, you can pick him up by scooping him into your hand. Never pick up a gerbil by the tail. After that, you can let your gerbil out of the cage for supervised exercise every day in a small, secured area where your pet can’t get stuck behind furniture or chew on electrical wires. Remember that gerbils do not have very good eyesight and may not recognize threats to their safety. Make sure that no other pets can enter the room and that there are no house plants in reach that could be toxic to your gerbil. Like Chinchillas, Gerbils sometimes like to have a sand bath. Place a half inch or so of high-quality sand into a box or bowl, and let your gerbils roll around and flip over. They will thoroughly enjoy themselves, and the sand will help to keep their coats healthy by removing excess oils. Take your gerbil to the veterinarian for a new pet exam, and every six months after for wellness exams. If you think your gerbil is sick, seek medical attention immediately. Common symptoms include sneezing, difficulty breathing, diarrhea and lethargy. Gerbils are also susceptible to external parasites such as fleas and lice. If you think your pet is infested, you’ll need to treat the animal, housing and surrounding environment.